I want a Captain Rex comic more than ANYTHING! We know that Rex is coming back in season two of Star Wars: Rebels. I want to know what happened to our favorite clone captain at the time of Order 66. They had plans to take Clone Wars into eight seasons! Some of those stories were about Rex and Ahsoka after Star Wars Episode III! But with the Disney-Star Wars buyout, they couldn’t have a show on Cartoon Network. The end of Clone Wars left me wanting to know the fate of Rex in particular. He was Anakin’s captain. He was a loyal soldier. That being said, I can’t see him being okay with Order 66. What made Rex different was he could put duty aside to do the right thing like in the Umbara arc. I can’t see him supporting Anakin, his good friend, becoming Darth Vader. I think he would be horrified by the Order turning his brothers into mindless killing machines. I want to see how he left the 501st to get together with Wolffe and Gregor to roam around the desert as adorable old men. My theory on how he escaped Order 66 has been pretty much confirmed, but I won’t spoil it for you unless you click here. Out of Celebration 2015, they showed a clip and sketches of Ahsoka. She struggled on her own after leaving the Jedi Order. How did she become the mysterious Fulcrum in Rebels? That’s a huge chunk of her life missing. My theory is that Ahsoka and Bail Organa were both friends with Padme. Maybe in the wake of her death, Ahsoka and Bail connected to form the Rebel Alliance. These are my two favorite Star Wars characters of all time. They have a massive story left to tell. I’mma gonna let you finish, Boba Fett, but Cad Bane is the best bounty hunter in the galaxy! So sit down and shut up. Bane is hands down the best villain in Clone Wars. He outsmarts the entire Jedi Order. He makes deals with the five leaders of the Hutt clan and backstabs them all. He fights two Jedi and escapes. He holds his own against Anakin, Ahsoka, and their platoon. He kills Jedi with no remorse. I mean, I love Boba Fett as much as the next guy. Cad Bane, though, does not get enough respect from the fandom. I had a small glimmer of hope when an older Duros male showed up in Shattered Empire. I can’t see Bane liking the Empire at all (it’s bad for business). I hoped it was my favorite bounty hunter, but it was some guy named L’ulo. DAMN! Cad Bane is ruthless, smart, and deserves at least a mini series. Did I mention that I love the clones? I might have said that once or twice, right? I love the loud and joking Jesse and the quieter medic Kix. 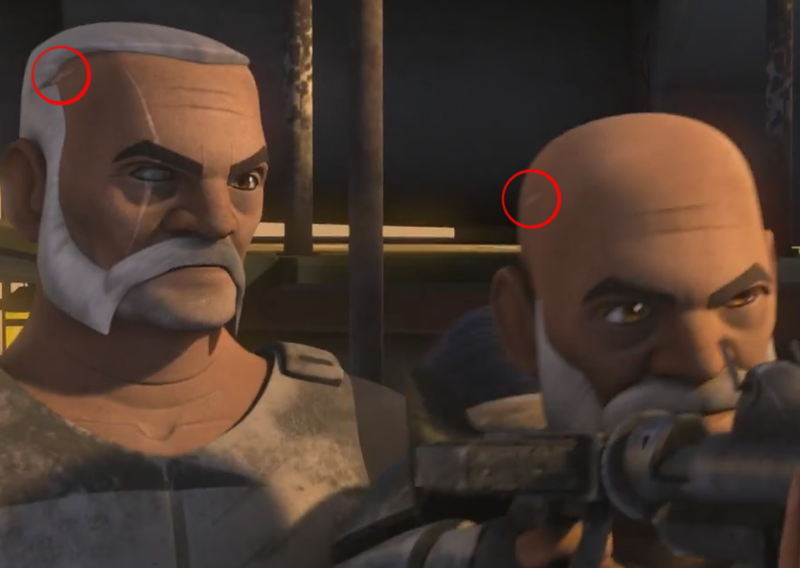 We know that Jesse has a rebellious side when he defied his general’s orders in season four of Clone Wars. Like Rex, it was to do the right thing. He was almost executed for it. Kix is much quieter, but his actions speak plenty. As a medic, he’s almost been killed a few times bravely saving his brother on the battlefield. Echo, who was thought dead, became the only surviving member of the Domino Squad. Thanks to “The Bad Batch” arc released over the summer, he now has these awesome abilities to access technology. The question would be whether or not he joined the Empire or walked away. That’s actually my question with these three. All of them were in the 501st Legion who became Vader’s First with the Empire. Did all the clones naturally join the ranks of the stormtroopers? Did these three participate in Order 66? I love the clones. What happened to them? On the reverse side, there’s Commander Cody who had been Obi-Wan Kenobi’s right hand man. We see in Episode III him participate in Order 66 and kill the Jedi. What happened next for him? If you consider it canon, Cody is in the video game Star Wars: The Force Awakens II. He’s brutal! He doesn’t consider the stormtroopers as good as clones. So, he uses them as cannon fodder and has low morale among his men. He doesn’t care at all if his troops die! I can see Rex being disgusted! This is what Krell did to the clones on Umbara (which Cody wasn’t apart of). In Rex’s wake, does Cody become Vader’s new right hand? These are answers I need to know. In a (not so great) twist, Darth Maul returned to Clone Wars after being cut in half in Episode I. Regardless of how you feel about this plot point, Maul had a very open ending. He was defeated by Palpatine who said he had bigger plans for his once apprentice than death. I have to admit that I haven’t read the comic Darth Maul- Son of Dathomir. It’s a canon story adapted from scripts that would have been in season six of Clone Wars. I’m not much help in that department. On the other hand, there’s some fantastic fan theories floating around about what happened to Maul. One of the biggest ideas is Maul becoming the template for the Inquisitors in Rebels. This makes a lot of sense to me. We saw Palpatine trying to kidnap Force sensitive children in Clone Wars. I don’t think it would be below him to use Maul in this way. To be honest, I wasn’t a huge fan of Darth Maul’s return. I would really want this comic if and only if it tied into Rebels. Ewan McGregor wants to play Obi-Wan Kenobi on Tatooine in a movie, and I want him too! Just in case this doesn’t come to fruition, how great would a Obi-Wan mini series be? Maybe even a long mini series like ten issues! There’s a huge chunk of time between the end of Episode III and when “Old Ben Kenobi” arrives in A New Hope. We saw a tiny glimpse of his life in Star Wars #7, but it’s what? Two days out of roughly twenty years? That’s not enough for me. How does he handle losing everything after Order 66? I’m sure he, more than anyone, struggles with guilt over Anakin becoming Vader. Does he blame himself for Padme’s death too? I bet he doesn’t go to Tatooine right away. Does he struggle not to follow his Jedi ways? I need to know these things! There’s so much story here for one of the best known characters from the Star Wars universe. When we last left Mandalore in Clone Wars, everything was on fire! No seriously, everything was burning. Duchess Satine was murdered by Darth Maul. Pre Vizsla, leader of the terrorist group Death Watch who overthrew the throne, was also murdered. We get a small glance of this through the eyes of Rebels character Sabine Wren. We know that the Empire swooped into the chaotic planet and took over. They established an Imperial Academy where she was a cadet. Since she doesn’t talk much about it, all we know is the Academy was hellish if you didn’t listen to orders. Something, we don’t know what, happened to her family, and she left. This is what I would want a mini series to be. I want to see this side of the Empire, but through the eyes of a child. Things aren’t happy and strong like the Empire wants her to think. The training is horrid. Sabine’s world crumbles around her causing her to join the Rebel Alliance. Like Obi-Wan Kenobi, there’s not a lot known about Yoda’s time on Dagobah. To me, Yoda has always been the Godlike Jedi. He rarely falters at most tasks. He’s incredibly strong in the Force. He oversaw the Jedi Order even after Order 66. Then, of course, he trained Luke to prepare him to face Darth Vader. I think it would really humanize him. If the Superman of Jedi had time to reflect on the Clone Wars and Order 66, then I think he could help prepare the Rebel Alliance. We see in Rebels that he contacts Kanan and Ezra from afar. Can he do this with other Jedi and guide them around the galaxy? This would be a great transition into the new movies and lead up to Yoda meeting Luke. What do you think about my list? Do you agree? Leave a comment and let me know! Hi,i dont know …but marvel made the worst star wars comics id ever seen.